The glycocalyx establishes the osmotic pressure difference of the plasma proteins across the vascular wall and plays a major role in determining the distribution of infused fluids in both normal and clinical settings. Loss of the glycocalyx compromises the retention of infused fluid in the plasma volume. On the basis of results from improved approaches to preserve and image glycocalyx structures, and quantitative evaluations of water and red cell interactions with glycocalyx components, the glycocalyx is now best understood as fibrous networks with varying composition within a three-dimensional structure: a quasi-periodic inner matrix associated with the endothelial cell membrane that forms the permeability barrier, and a more porous outer region whose composition varies with distance from the endothelial membrane and which determines red cell hemodynamics. This chapter explains why the common concept that the changes in the thickness of the glycocalyx layers extending more than 0.5 microns from the endothelial surface can be used as biomarkers of glycocalyx function must be carefully evaluated. It provides a detailed analysis of two modern approaches to measure glycocalyx function in clinical settings: (1) measurement of glycocalyx volume as a difference between the distribution volumes of red cells and macromolecular tracers; and (2) direct visualization of changes in the penetration of red cells into the cell-free layer at the walls of sublingual microvessels. Method 1 overestimates glycocalyx volume because it assumes tracer concentrations in the glycocalyx and plasma are the same, and also assumes large vessel hematocrit provides an unbiased measure of plasma volume in the whole circulation. Method 2 appears to characterize some microvascular dysfunction, but ignores differences in porosity between inner and outer layers of the glycocalyx, and the role of changes in red cell mechanics, independent of the glycocalyx, to influence penetration into the cell-free layer. 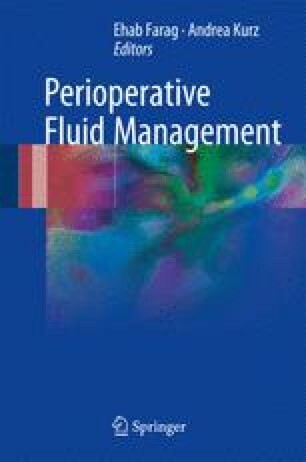 By identifying these limitations, the chapter should provide a basis to reevaluate ideas about the distribution of infused fluids within and across the glycocalyx during perioperative fluid therapy, encourage further improvements of these and similar methods, and enable comparisons with analytical approaches to measure the accumulation of specific glycocalyx components in plasma and urine as biomarkers of glycocalyx function. On the basis of the principles outlined in this chapter, the final summary addresses some of the frequently asked questions about glycocalyx function and fluid balance that are likely to arise during perioperative fluid therapy. KPA would like to acknowledge the British Heart Foundation (PG/15/37/31438) and the Bizkaia Talent Fellowship Scheme (AYD-000-256).